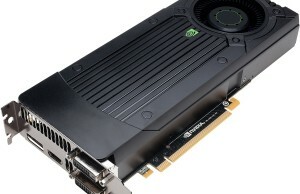 Nvidia introduced a few days ago its new GeForce GTX 960 GPU. Wondering how two of these cards perform in SLI configuration? We find out on the basis of benchmarks in 12 games, including frame-time benchmarks! Let us be very clear: the fact that we publish a GTX 960 SLI test does not mean that we encourage you to consider a setup like this. Our primary reason to run these tests and to publish this review is that we know that many of you, our readers are interested. Since years we write that SLI or Crossfire with mid-range cards is actually a nonsensical exercise. If you can achieve the same level of performance with a single GPU is always preferable. Which we will see later: where two GTX 960’s pure when you go to the framerates look regularly match the level of a single GTX 980, we see the frame time analysis that we perform in different games that the single GTX 980 much lower 99th percentile frame time. Or: the variation in the render times of individual frames is lower, or the game “feels” smoother. And that in itself is not surprising: in SLI are in the background, of course, all kinds of processes that need to synchronize the work of both GPUs as well as possible to ideally ensure that GPU 2 exactly half the time GPU one needs new frames calculation can conclude its work. But since the calculation of frames occupies no fixed duration, by definition, never fails to synchronize perfectly and you get a variation in the times between underlying frames. In a single GPU exists no such problem, since all the individual frames, of course, there simply by one and the same chip, are calculated one after the other. In fact, SLI or Crossfire our opinion interesting for two scenarios: 1) two or more high-end cards to reach a level of performance with a single GPU is not possible, or 2) as an upgrade when your system with a particular map after a period of time is no longer sufficient. Because option 2 is indeed interesting to watch GTX 960 in SLI. When you buy a GTX 960 and say in a year against limits Start Up with newer games or against limits for a new monitor with a higher resolution, you can show considerable performance with the investment of a second GTX 960 increase. A new map of the same performance level (the GTX 1060) is currently believed to long after are not as fast as two GTX 960’s in SLI – remember: a GTX 960 is only 11% faster than a GTX 760 – and a high-end card like the GTX 980 or its successor will always be more expensive. But, we can talk clearly about a situation in the future, buy it now direct two GTX 960’s we would not recommend. 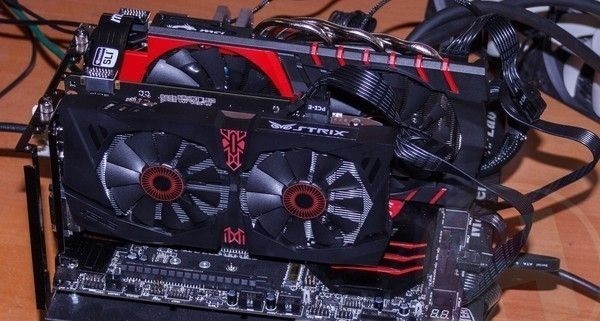 To perform this test, we combined the GTX 960 cards ASUS and MSI sent us. Both cards are clocked back to the standard GTX 960 clock frequencies, and we setup all benchmarks, as also shown in our initial GTX 960 review showed through. Besides the average frame rate (fps) is measured in a number of games also frame times. On the basis of the scores of the 12 games we calculate the Hardware.Info 2015 GPU performance score, which, in fact, for each of the six resolutions / settings is the average of the seven frame rates. This GPU performance score indicates a glance the best impression of the performance of video cards. The GeForce GTX 960 in SLI, we tested with GeForce driver version 347.25. On the product pages of other GPUs (click on the name of a GPU in the graphs to go there) you will find the driver versions that we have used for other products. The charts on the following pages is to recognize the GTX 960 with blue bars, the SLI configuration of two GTX 960’s we display with black bars. Older Nvidia cards are green, other AMD cards are red. In 3DMark Fire Strike achieve two GTX 960’s in SLI a score of 11,158 points, almost the level of a GTX 980. In Fire Strike Extreme score of 980 is even equaled. On our new test system we run Battlefield 4 for AMD GPUs with Mantle and Nvidia GPUs with DirectX. In Battlefield 4 we measure an excellent scaling. Full HD Ultra settings is the combination of two cards, the GTX 980 even over, but prove the frame time test that one high-end card in practice really leads to a smoother result than two mid-range cards. In civilation: Beyond Earth we measure an excellent, almost linear scaling and go two GTX 960 at high settings again the GTX 980 over. In Crysis 3 we see that two GTX 960’s in terms of frame rate the level of a GTX 980 managed to emulate. If we look at the time frame analysis that we do in this benchmark, we must again conclude that the single GPU clearly provides smoother game experience. In Far Cry 4 we may draw the same conclusion, as is the 99th percentile frame time of the GTX 960 SLI configuration here somewhat closer to that of the GTX 980. On our new test system we run Thief for AMD GPUs with Mantle and Nvidia GPUs with DirectX. In Thief rubs the combination of two GTX 960’s against the GTX 980 to, or is that there sipping over. The last game we testing Watchdogs. Again we see a fine scaling of SLI, as long as we at least look at the frame rate. We look at the 99th percentile frame rendering time, we must again conclude that a single high-end GPU provides a smoother game experience. If we look at the benchmark results – and pure frame rates! – Full HD with highest settings or Ultra HD with medium settings, we see that the combination of two GTX 960 cards average performance level of a single GTX 960 goes well beyond and even at the level of a GTX 980 rubs. In Ultra HD is the average scaling in 12 games over 76%, so fine. 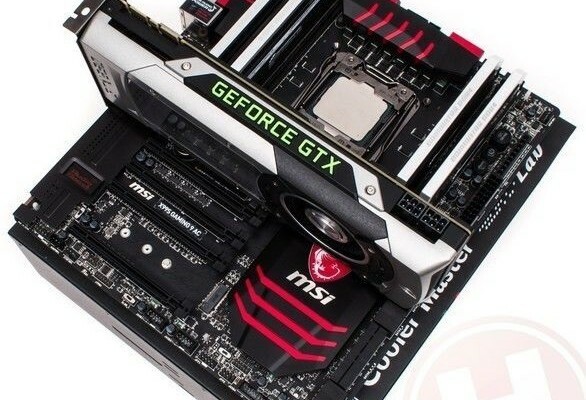 Consider your order right now to buy two GTX 960’s for a SLI configuration: do not! A single GTX 980 is undoubtedly the better option. Proof that you see above in the games where we have done a frame time analysis: Due to the synchronization problems at SLI configurations creates a greater variation in the time between successive frames, so the 99th percentile time frame is much higher. In normal human language: the frame rate may be identical, the game will really feel smoother with a single GTX 980. The only situation where we the GTX 960 in SLI is a smart option when you buy a single card and next year because of new games will upgrade your performance. A two GTX 960 places there will probably result in a higher performance gain than a new mid-range card and a new high-end card will obviously be a more expensive option. Or: for now it is mainly interesting to know how two GTX 960’s performance together. 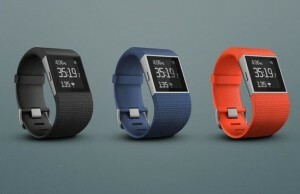 At the earliest in a year can lead this information is potentially a sensible purchase.